This week Kyle is solo having a very intimate chat with Joe Dosch about Black Metal. They talk about the strangely universal nature of this extreme music genre. Joe chronicles his early days of discovering metal and does a pretty fantastic job explaining the appeal of extreme music. They talk about what makes a good black metal band and they explore some of the darker and more unseemly sides of the genre as well. Good lucky trying to spell most of the band names they bring up this episode, but honestly its a pretty solid primer for the uninitiated into the world of black metal. And hey, we even stay on topic for about the first hour and change. The last forty minutes Kyle and Joe totally go off topic and end up talking about life, art, politics, and in general are two friends catching up and chatting. If you don’t wanna hear two guys chatting, if you bail about an hour and ten in, you should get pretty much your fill of metal. Also, this was recorded in early June and then go lost in the cracks for a few months. We are glad we are finally able to present it to you and sorry to Joe for it taking so gosh darn long. Kyle’s album taping is this upcoming Monday (Dec 3rd) at 8pm at Star Bar in Atlanta, GA! If you live in the area come hang. 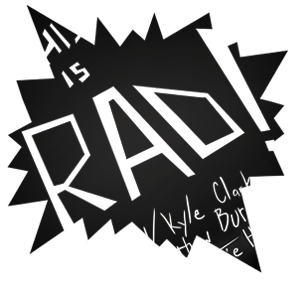 Tweet @kyleclarkisrad or @thisisradpod for more info you if you’re thinking of coming.